George Miller has stopped making talking pig and dancing penguin movies (Babe, Happy Feet) long enough to give us another installment in his seminal apocalyptic Mad Max series. The result is probably one of the greatest non-stop action movies ever made. Tom Hardy takes the reigns from Mel Gibson as the title character, but gets to sink his teeth into the role quite a bit less than Gibson was able to. In Mad Max: Fury Road, Mad Max is very much part of an ensemble, not the leading man — which is by no means a problem, just something to get used to if you’ve been following the series. This time around, the story hinges more on the actions of a character named Furiosa, played by Charlize Theron. 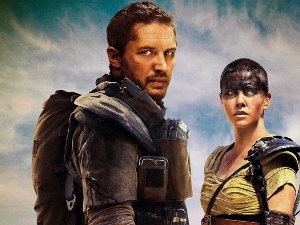 Together with Max’s help, the two characters are essentially trying to lead a handful of bride-slaves to some sort of promised land from Furiosa’s memory, before the bride-slaves’ brutal husband, Immortan Joe (a suitably intimidating Hugh Keays-Byrne), catches up with them and drags them back to his fascist desert oasis. To be honest, I am still — weeks later — processing my feelings about Mad Max: Fury Road. On one hand, it was supremely entertaining and viscerally enticing. The stunt work in this film is probably the best you’ll ever find in any movie. Like, ever made. Miller’s vision of a ripped-up tomorrow has always been visually stunning, never more so than here — especially when Immortan Joe’s posse of kamikaze zealots lead a pursuing parade after Max and Furiosa, complete with drum beaters and a guitar that throws fire (real fire, by the way). But the other part of me, the old part to be sure, couldn’t help but feel left in the dust by the rapid-fire pacing and picture cutting. I guess Mad Max: Fury Road might be the best possible movie made for the post-MTV attention deficit generation. To suit my own tastes, I would have liked a few more breaks in the rhythm, a few more moments to absorb what I was seeing and let it wash over me. Mad Max: Fury Road is indeed a lot to take in, so brace yourself and pay attention. It will either be the most thrilling movie you’ve seen in years, or leave you walking out of the theater like you just survived a car crash.